This tool was designed to be a usable tool for creating text alternatives. The amount of time required to create text alternatives depends on how much time and effort you are willing to spend. The more time you spend on it, the more information is known about the image and could result in more informative text alternatives. However, you are not required to spend more time than you feel is necessary. The target audience of this tool are developers who want to create good and informative text alternatives but might not know how to go about doing so or want help doing so. Non-developers can also make use of this tool to create text alternatives for Web sites, presentations, documents, and other media. Formulate text alternatives for each container based on the allocated statements (with the aid of the Results page). The amount of time and effort you wish to spend on creating text alternatives depends on you. As more time is spend using the tool, the more information is identified about the image and could result in more informative text alternatives. It is understandable that you may not have as much time to thoroughly make use of the tool and consider all of the information about the image but still wish to create good text alternatives. This tool can help you create text alternatives whether you have little time to spend or you wish to do a more thorough job on it. On the Describe page, you can select only the categories of questions you want and answer only a few questions in the category. For example, you may identify the people in the image but not describe their facial expressions or their appearance. On the Allocate page, you may allocate only the Essential statements to containers. On the Results page, you may choose to write only the caption and/or primary alternative text. On the Describe page, you can identify some of the components in the image and answer all of the questions in some categories for some of the components, marking these categories as "Done". On the Allocate page, you may allocate the Essential statements and some of the Significant and Helpful statements. On the Results page, you may choose to write the caption, primary alternative text, and secondary alternative text. On the Describe page, you should identify all of the important components in the image, answer all of the questions in every category for every component, and mark each category as "Done". On the Allocate page, you should allocate every Essential, Significant, and Helpful statement to containers. You should mark the allocations as "Done". On the Results page, you should make use of the statements to write the main document text, caption, primary alternative text, secondary alternative text, and help. Only three general cases are described here. You may do as much and as little as you wish to create text alternatives. Keep in mind that good and informative text alternatives require time to write and cannot be done quickly. After writing text alternatives, they should be tested with actual users to ensure that they are useful to users. The purpose and context of the image explains the reason that the image exists in the document. It influences the importance of the image components, the importance of each piece of information about the image, and the text alternatives produced. The text alternatives that are produced should be useful and helpful to users reading the document. Based on the purpose and context of the image, appropriate text alternatives should be presented to users. This may mean that different text alternatives are generated with each usage of an image. Therefore, in the process of developing text alternatives, the purpose and context of the image should always be kept in mind and considered. There are four (4) importance levels you can assign to each piece of information: Essential, Significant, Helpful, and Not Important. Essential - Essential information is necessary to understand the image within the document. Essential information may have some or all of the following properties. As more of these properties apply, it is more likely that the information is essential. It is aimed at the target audience of the document. It must be known in order to comprehend the document. Most people want / need it most of the time. The person would be confused as to what the document is talking about without this information. Without it, the person has no idea why the image is there or what the image is for. It provides a good first impression of the image. Based on this information, the user will determine if they need/want to know more about it. For the content provider, this is the information that the content provider absolutely wants to tell people about. It provides the essence, purpose, function, or intent of the image. It identifies that the image conflicts with the main document text and that this conflict is intentional. Significant . Significant information is useful for getting a comprehensive understanding of the image, when such information is desired. Significant information satisfies the more detailed interests of most users most of the time. Significant information may have some or all of the following properties. As more of these properties apply, it is more likely that the information is significant. It is aimed at the target audience. It gives a more detailed and thorough understanding of the image and/or document. It is information that could be obtained by more than a quick glance. The person should know about it as they are reading the document in order to understand the document. The person decided to know more based on the essential information. This information goes into more details about the essential information. Without this information, the person has an idea of what the image is about and the reason the image is there, but does not have a detailed understanding about it. For the content provider, this is information that further explains and gives more details on what the content provider wants to tell people. Helpful . Helpful information provides a more thorough understanding of the image within the document in which it appear for those users who wish a more detailed description of the image. Helpful information may have some or all of the following properties. As more of these properties apply, it is more likely that the information is helpful. It is specific details that might be of interest to some who are the target audience of the document. It is targeted towards very specific audiences (other than the target audience) or a subset of the target audience. It provides the person with a better understanding of the image when the person is not an expert in the topic area or not the target audience of the document. It might reassure the person that they have not missed something of greater importance. Without this information, the person has a fairly complete understanding of what the document is about but have some things that the person still wants to know. It includes different or other possible interpretations of the information being expressed by the image. For the content provider, this is information that could clarify some things for some people. It includes optional extra information that is seldom wanted or needed, but elaborates on what is already there. Not Important . Information is not important if it does not help to provide much additional understanding of the image for any users in order to understand the image or document in which it occurs. This can include information that is not appropriate to consider given the context of the image within the document. Information that is not important may have some or all of the following properties. As more of these properties apply, it is more likely that the information is not important. Very few to no persons will want to know or care to know this information. It is not important enough to mention. Without this information, the person knows everything they want or need to know in order to understand the document and/or image. This is information that might result in unintended confusion or boredom and does not help people understand what the content provider is saying. On the Describe page, there are three drop down menus. The first drop down menu allows you to choose the image that you wish to identify information for. The second drop down menu allows you to select an image component within the image to identify information for. The third drop down menu allows you to select the category of information to identify information about. Based on these three selections, a set of questions (many of which are in the form of statements) are presented along with importance level ratings for each question. Every question has associated help information and examples, which can be found in the form of a tool tip when the mouse cursor is placed on the question itself. For each question, you have the option to select answers already provided for other components in the image. You can choose to use the exact same answer as other components or you may edit the answer based on other components. While identifying information about the image and assigning importance levels, the purpose and context of the image should be kept in mind. In different contexts and purposes, the same piece of information may have different importance levels. Once the answers are complete and the importance level ratings are provided, you can press the "Done" button on the bottom left to save and lock the answers. This will also take you to the next category of questions to provide additional information about the image and component. The information communicated by an image can be identified using generic or specific terms. For example, it is possible identify an automobile by "car" (which is generic) and "Toyota Yaris" (which is more specific). With more details, it become even more specific. It is recommended that the information be as specific as possible, making use of vivid, succinct, and imaginative words so that users can have a better mental image within a limited amount of time and words. However, it should be kept in mind that the context may not require specific details to be communicated. The information can be generalized when writing text alternatives if necessary. Text alternatives can also be used by persons who can see the image. As a result, there may be times when the information communicated by the image may be misinterpreted by the user. Therefore, it.s important to differentiate between the information that was intended to be communicated to users and the information that was actually communicated. Both the intended and actual information can be important and may need to be reported to users in order to minimize misinterpretations or miscommunications. Having the knowledge to properly interpret the image may also influence the information identified. A person with the knowledge or ability to interpret the contents of the image may not be able to provide more information about the image than a person without the knowledge. For example, a software engineer may be able to interpret a UML diagram while a biologist may not know the meaning of the various symbols used. However, it is not always necessary to have expert knowledge about an image in order to identify information about an image. The purpose and context of an image highly affects whether or not expert knowledge is necessary. Even without expert knowledge, a person could describe what is seen within the image without interpretation. The goal is to be as descriptive as possible so that better text alternatives could be created. Image components are parts of the image that may be important for the viewer to know about and understand in order to understand the entire image. As components are identified, more information can be identified about that specific component and provide more details about the image to users. If the image components are not identified, the questions may be answered for the entire image rather than each component. This may result in less detailed or specific information. Examples include persons, objects, shapes, areas in the image, steps in a sequence, and each image in a slide show. In the image below, possible components include the Whole Image, the plate of desserts, and the cup of coffee. Depending on the purpose and context of the image, it might or might not be necessary to break the image down into smaller components. 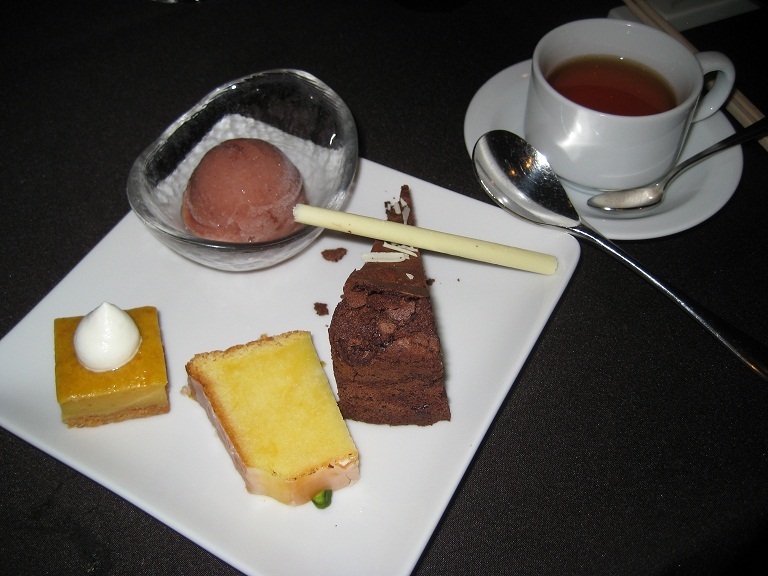 The plate of desserts could be broken down such that each dessert is its own component. Based on the purpose and context of the image, these components may be deemed as not important and other components may be included instead. 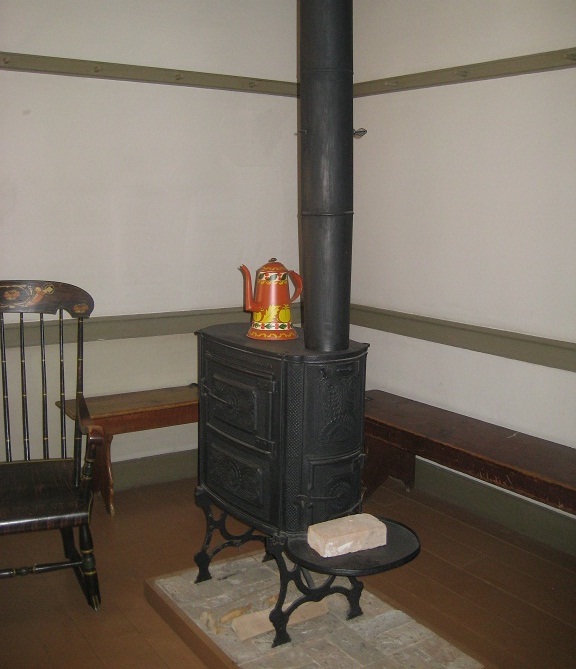 In the image below, possible components include the Whole Image, the furnace, the kettle, and the brick. Depending on the purpose and context, it might be important to identify additional components. If the purpose is to illustrate the ways homes were in the 1800s, then it may be important to identify the bench in the background, the rocking chair, the walls, and the flooring as components. The Allocate page is used to allocate each statement about the image to one or more containers of text alternative. At the top of the page is a drop down menu in order to change the image that you wish to work on. Changing the image will automatically save your selections. On the page, the statements (identified from the Describe page) are organized by importance. Based on viewing this sorted list, you may decide to re-evaluate the importance of some statements. Double-clicking on a statement will take you to the statement on the Describe page in order to re-assign the importance rating. - = not provided through text alternative. Placing the mouse cursor above each check box will display a tool tip with the name of the text alternative container. It is possible for a statement to be allocated to multiple text alternative containers. However, it is suggested that information should not be repeated between the different text alternative containers. It is not necessary for every text alternative container to be used. It is better to not use a text alternative container than to repeat the same information for the sake of making use of all the containers. The same information may be provided through multiple containers if additional information is also provided that is not in other containers. There may be times when information is better provided through a link to an external source. For example, an external source may have more detailed and complete description of a product or painting than can be given in a text alternative. In such cases, it is better to provide users with a link to the external source than to re-iterate the information yourself. When you are done allocating each statement to at least one text alternative container, click the "Done" button on the bottom right corner to save and lock your responses. At the bottom left corner, there is a "Output text" button. This exports the statements to HTML document so that you can work on the statements away from the tool. This tool is intended to help you to identify and organize information about an image so that you can formulate text alternatives. This tool, so far, does not automatically generate text alternatives based on your answers. It is still necessary to make use of the statements generated by this tool to formulate and "word smith" actual text alternatives. The Results page can be used to keep track of the statements about the image that have already been used in text alternatives. At the top of the page is a drop down menu in order to change the image that you wish to work on. Changing the image will automatically save your selections. On the page, the statements (identified from the Describe page) are organized based on the text alternative containers that the statements have been allocated to (on the Allocate page). Based on viewing this sorted list, you may decide to re-evaluate where each statement is allocated. Each statement is associated with two options: "Done" (which means that the statement has been incorporated into a text alternative) and "To Do" (which means that the statement has yet to be incorporated into a text alternative). On the bottom left of the page is a "Output Text" button, which exports the statements to HTML document so that you can work on the statements away from the tool. When formulating text alternatives, the purpose and context of the image must be kept in mind so that the resulting text alternatives are intelligible and useful to users. It is recommended that vivid, succinct, and concise words be used to make good use of the limited time and space available. The text alternatives should flow with the main document text and make use of the same vocabulary since screen readers will read text in the order that is presented without noting if it is a text alternative or part of the document text. It can cause confusion if the main document text jumps to a text alternative mid-sentence. It is recommended that the most important piece of information be identified and communicated first to the users. The user may choose not to listen or read the entire text alternative. Therefore, the most important information should be presented first. The text alternatives should refrain from repeating information that has already been presented through the other text alternatives. While there are times when it is necessary to repeat information, text alternatives should be useful to users. If a text alternative provides the exact same information as what has already been presented to users, then it is not useful. The same information may be provided through multiple containers if additional information is also provided that is not in other containers. There are times when you decide to not provide certain information. It may be due to confidentiality or the information may conflict with other information. Users may wonder whether certain information exists in the image and if so, why it was not provided. Therefore, it may be important to tell users when information has been deliberately removed or omitted so that users understand the reason that the information is missing. This tool is property of USERLab at University of Saskatchewan.